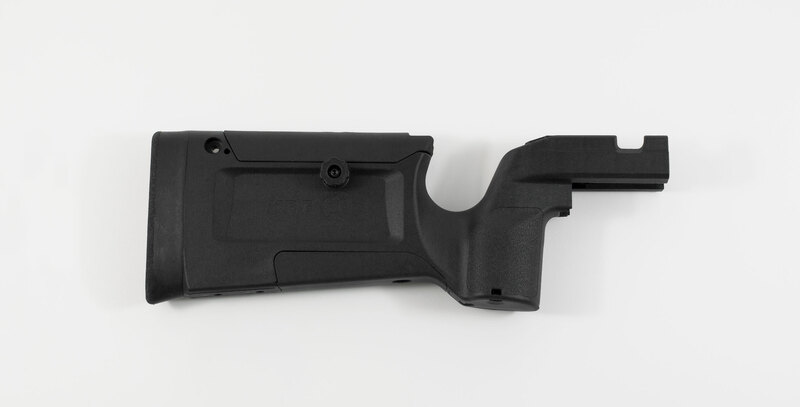 Bravo Rear stock: Purchase the comfortable Bravo rear stock half separately if you already have a KRG chassis and would like to mount it on a Whiskey-3, X-ray, or 180-A for CZ-455 or Howa 1500 Chassis or as a spare for your current Bravo chassis. You can even put it on a Sako TRG. We introduced the Bravo in Nov '17 and have received a lot of positive feedback on the comfort of the grip and rear stock in general. It will fit all generations of chassis noted below. It features a storage area in the grip, plus a removable lower cover that is replaced with our Hook Style Cover to give a hand hook on the bottom of the stock. It comes with tool-less cheekpiece height and spacer Length-of-Pull adjustment. Included is the 1-3 LOP spacer pack to add up to 1.125" to the standard LOP of approx 12.8", also included is a QD cup which can be mounted on the upper rear near the buttpad, on either side. Fits: All generations of Whiskey-3, Bravo, and X-ray chassis; for Rem 700SA/LA, Tikka T3, Howa 1500, CZ-455 and TRG-22/42 and Sako M995 inlets of KRG chassis.